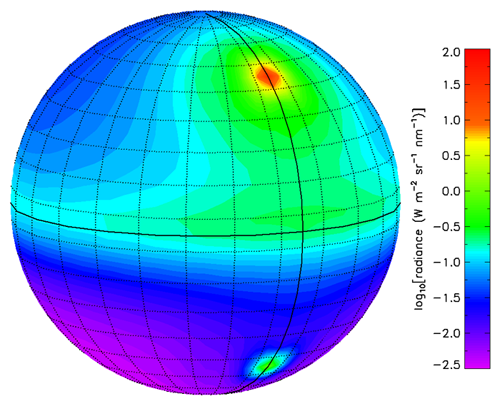 The HydroLight radiative transfer numerical model computes radiance distributions and related quantities (irradiances, reflectances, diffuse attenuation functions, etc.) in any water body. Users can specify the water absorption and scattering properties, the sky conditions, and the bottom boundary conditions in various ways, e.g., by selection of built-in bio-optical and sky models, by reading in user-supplied data, or by writing their own Fortran subroutines to define their input. 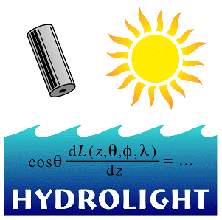 HydroLight then solves the scalar radiative transfer equation (RTE) to compute the in-water radiance as a function of depth, direction, and wavelength. 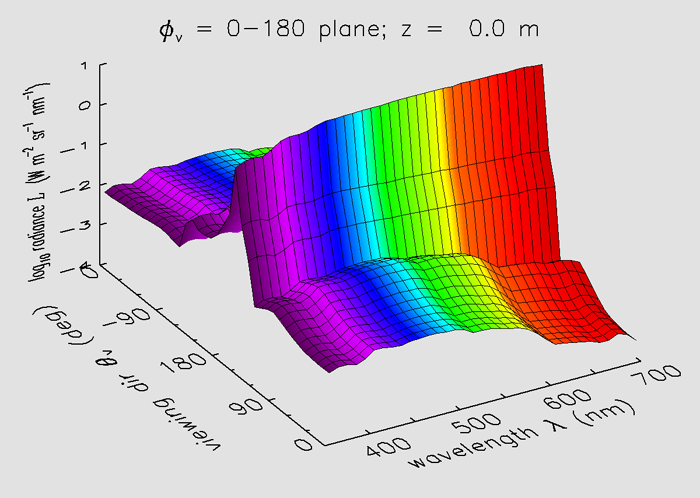 Other quantities of interest to optical oceanographers, such as the water-leaving radiance and remote-sensing reflectance, are also obtained from the computed radiances. Output is presented as ASCII (printout) files, as Excel® spreadsheets, and as digital files formatted for plotting and analysis using IDL® or other graphics programs. As a predictive tool: What will the oceanic light field be at some time in the future? Given a prediction of water absorption and scattering properties, HydroLight can use that information to predict the corresponding light field. As a data analysis tool: What was the ambient light field when the data were taken? For example, when imaging an underwater object in the daytime, the ambient daylight contributes noise (in this case, path radiance) to the signal of interest (the light propagating from the target to the sensor). HydroLight can compute the ambient daylight field so that it can be subtracted from the total signal received at the sensor to improve the signal-to-noise ratio of the detected signal. As a system design tool: How would a proposed system perform under different environmental conditions? HydroLight can serve as a controlled environment to predict what the light field received by a sensor would be under a wide range of conditions. Such control of the environment and of simulated noise cannot be obtained in the field, which is best used for final testing and evaluation of sensors that were first designed using numerical simulations. As a teaching tool: How can someone new to the field of optical oceanography most quickly build up “intuition” or a “working knowledge” about the marine optical environment? The best way to gain such knowledge is of course to spend 20 years working as an optical oceanographer. The next best way is to use HydroLight to study how oceanic light fields depend on various environmental parameters. The current release, HydroLight-EcoLight version 5, includes both the full HydroLight model and a specialized version of HydroLight, called EcoLight, that runs much faster than the full code but computes only irradiances and related quantities. (EcoLight, which is bundled with HydroLight and runs within the same user interface, is different from the EcoLight-S subroutine, which is designed to be imbedded in the user’s own code, such as an ecosystem model.) See the technical document “What’s New in HE5” for more information about EcoLight. The other .pdf files listed in the Software & Download section give additional information about the technical specifications of HydroLight and EcoLight.